In the early nineteenth century, a new age began: the age of questions. In the Eastern and Belgian questions, as much as in the slavery, worker, social, woman, and Jewish questions, contemporaries saw not interrogatives to be answered but problems to be solved. Alexis de Tocqueville, Victor Hugo, Karl Marx, Frederick Douglass, Fyodor Dostoevsky, Rosa Luxemburg, and Adolf Hitler were among the many who put their pens to the task. The Age of Questions asks how the question form arose, what trajectory it followed, and why it provoked such feverish excitement for over a century. Was there a family resemblance between questions? Have they disappeared, or are they on the rise again in our time? 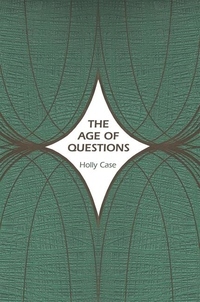 In this pioneering book, Holly Case undertakes a stunningly original analysis, presenting, chapter by chapter, seven distinct arguments and frameworks for understanding the age. She considers whether it was marked by a progressive quest for emancipation (of women, slaves, Jews, laborers, and others); a steady, inexorable march toward genocide and the "Final Solution"; or a movement toward federation and the dissolution of boundaries. Or was it simply a farce, a false frenzy dreamed up by publicists eager to sell subscriptions? As the arguments clash, patterns emerge and sharpen until the age reveals its full and peculiar nature. Turning convention on its head with meticulous and astonishingly broad scholarship, The Age of Questions illuminates how patterns of thinking move history.